Below are common attributes associated to Black Diamond Crepe Myrtle (Series). Become a care taker for Black Diamond Crepe Myrtle (Series)! Below are member comments regarding how to plant Black Diamond Crepe Myrtle (Series). No comments have been posted regarding how to plant Black Diamond Crepe Myrtle (Series). Be the first! Do you know how to plant Black Diamond Crepe Myrtle (Series)? Below are member comments regarding how to prune Black Diamond Crepe Myrtle (Series). No comments have been posted regarding how to prune Black Diamond Crepe Myrtle (Series). Be the first! Do you know how to prune Black Diamond Crepe Myrtle (Series)? Below are member comments regarding how to fertilize Black Diamond Crepe Myrtle (Series). 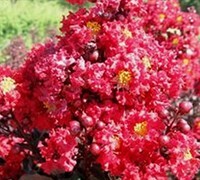 No comments have been posted regarding how to fertilize Black Diamond Crepe Myrtle (Series). Be the first! Do you know how to fertlize and water Black Diamond Crepe Myrtle (Series)? Below are member comments regarding how to deal with Black Diamond Crepe Myrtle (Series)'s pests and problems. No comments have been posted regarding how to deal with Black Diamond Crepe Myrtle (Series)'s pests and problems. Be the first! Do you know how to deal with pests and problems with Black Diamond Crepe Myrtle (Series)? Looking for Black Diamond Crepe Myrtle (Series)? This crape myrtle can be used as an annual in zones 2-5. Use as annual blooming summer color in landscapes or in patio planters that can be brought inside for the winter. In zone 6 it can be grown as a perennial and used as a flowering hedge that will regrow from the ground each year. Plant can be cut down to 4 inches each winter and will regrow to make a 3 to 4 foot flowering shrub each year. In zones 7-9 It will grow as a Deciduous shrub or small tree planted in ground or potted as a great patio tree. The BLACK DIAMOND Crape myrtles were bred by a USDA research scientist and feature five vivid color selections including ‘Best Red’, ‘Crimson Red’, ‘Red Hot’, ‘Blush’, and ‘Pure White’. The Black Diamond Series is a repackaging according to the breeder of the non-patented Ebony series crape myrtle.